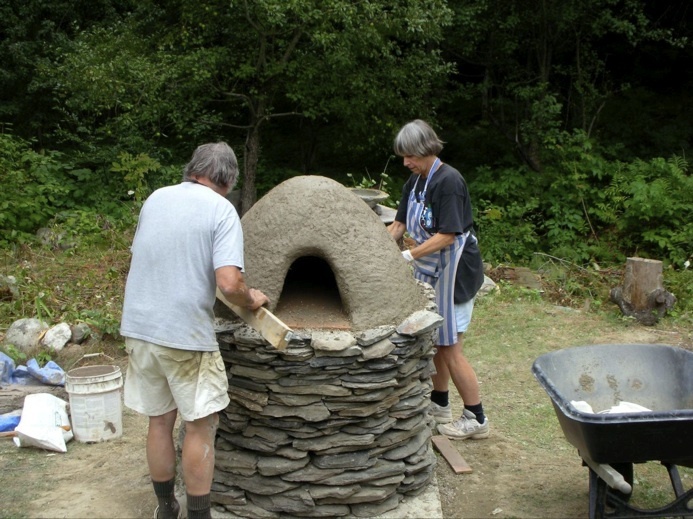 Learn to easily build earth and simple brick ovens for outdoor bread baking. Detailed step by step instructions accompany the photographs and graphics. No building experience required. When the weather turns really nasty, we'll come indoors and bake in a conventional oven with some simple techniques. Also included are sections on sourdough and no-knead bread baking. From bagels to pita breads to pizzas in your wood-fired oven. It's all here, including historical references that make oven building and bread baking a most enjoyable experience. One reason I love to bake bread is because each loaf is different, an adventure in itself. That’s because I’m always experimenting with ingredients and procedures. By pushing the boundaries, I never know exactly where I’m going to end up, and I prefer it that way. I’ve never found a bread baking niche because I’m not looking for one. Rather, I enjoy the discoveries I make and I live with both my failures and successes. The failures I keep for myself and the birds; the best breads I give away. For a long time the loaves themselves were my focus and my challenge, and I wasn’t too much concerned with the subject of bread ovens. Then during a trip to Paris I visited the Poilane bakery on 8 rue du Cherche-Midi. After descending the exceedingly old stone stairs into the cellar, I was privileged to observe a baker at the very large wood-fired oven. Right then I realized that my baking style would change because without doubt, I too, would have a wood-fired oven, only mine would be outdoors. And that’s how I now bake bread, in a manner that has not changed in millennia. When I fire up my outdoor earth oven during any of our four seasons in the Northeast, I enter another dimension. I sense a link between all those who bake in this elemental way and me. Perhaps, you too, want this connection. 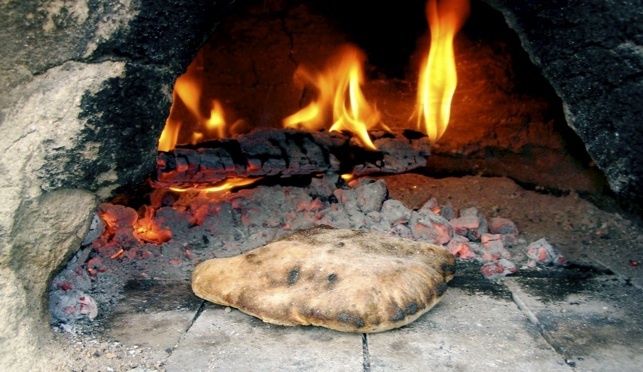 If constructing your own wood-fired oven interests you, and if you enjoy baking bread or would like to learn how, then you will find useful information here. I don’t pretend to be a renowned expert, but because of the pleasures I’ve discovered in bread baking and oven building, I want to share my learning experiences with you. We’ll be looking at two basic kinds of ovens or variations. One type of oven is constructed with mud and the others with brick. The simple brick ovens I build take less time to construct than the mud ovens, but the materials cost a little more. The ovens are similar in that they all fire with wood, and they all have an incredible capacity to produce unspeakably wonderful breads and pizzas. If they don’t, then you’re doing something wrong, but I’m going to work with you as best I can to help you to get it right. No, you don’t have to be a mason to build the ovens I’m going to describe. Just rudimentary construction skills coupled with desire will suffice. I’m definitely not a mason and masons would smile or cringe at my lack of skill with the trowels, but these gloved hands get the job done quite well. You can choose to have an oven built for you or buy a prefabricated oven. If you decide to do this, you’ll be guaranteed a very fine bakeoven indeed. In the resources section at the end of the book, I’ll make a couple of recommendations. However, a simple oven you construct yourself will bake just as well, at a cost of perhaps a few hundred dollars. To become good at baking, you have to bake a lot and understand some basic principles. We’ll look in detail at the basic principles, but don’t get discouraged if your breads don’t rise to your expectations at first. Expect some failures, but you’ll learn from them. Our focus will be on baking sourdough breads, raised and flat, but we’ll also be making no-knead breads, some with yeast and some with sourdough starter. Where the commercial baker has to strive for uniformity and consistency of product, that won’t be your concern or mine. We can be free to explore and innovate, and there’s no need for our loaves to have the appearance of being cloned from a previous loaf. An oven made of earth and a fire made from burning wood combine to produce breads most rustic and appealing. If you live where the weather in the winter becomes overwhelming, with too many snowdrifts to surmount, and your firewood is somehow lost under the snow bank, then you might want to stay in the house and bake breads in your conventional oven. Yes, it’s okay to be the baker who came in from the cold. An indoor technique that I use is called baking undercover, and I believe you’ll find breads made this way can equal and even surpass the loaves you make in your outdoor wood-fired oven. What you gain by baking indoors is control. More about this later on. What we won’t be baking indoors is pizza. Pizzas need to be baked on the hearth of a wood-fired oven where the floor temperature is about 700ºF. You can’t attain these temperatures in a conventional oven. A bake stone in a conventional oven helps, but it’s only a compromise. Pizzas need to be kissed by fire. It is the fire that gives pizza that rustic quality. To help you decide what type of oven to build, refer to the photo gallery section at the end of this book. There, you’ll find ovens from the conventional to the bizarre, and I know your imagination will be stimulated. This chapter has been adapted from my book “Earth Oven Adventure,” a real life story about Abbott and Nancy Meader who built an oven in their backyard. Although they had some assistance from friends and me, Abbott and Nancy did the bulk of the work. And there was real work involved. If you can’t or don’t like moving heavy materials around, then you shouldn’t be building this type of oven. 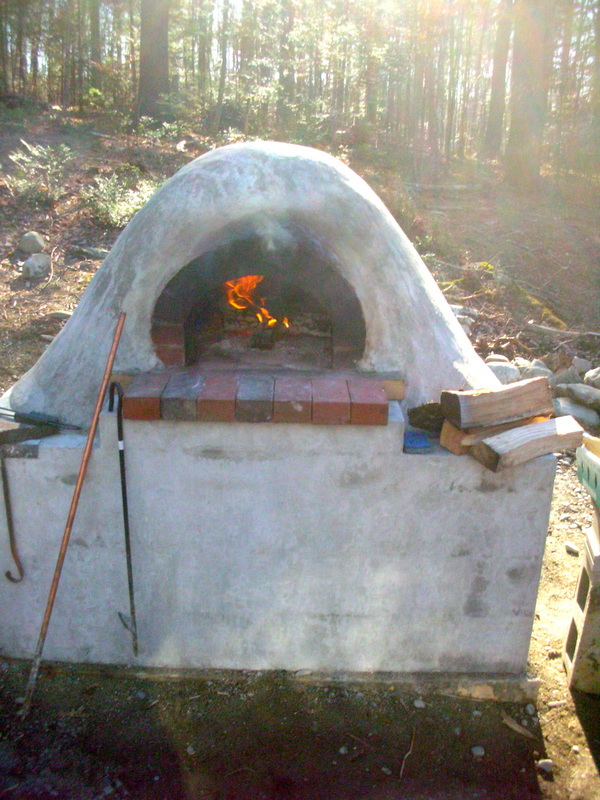 Of course you can always have someone build it for you, but if you personally get involved in the physical part of the process, I believe you'll have a greater appreciation for your earth oven. All it takes is desire and not minding the mud you’ll find on your hands. 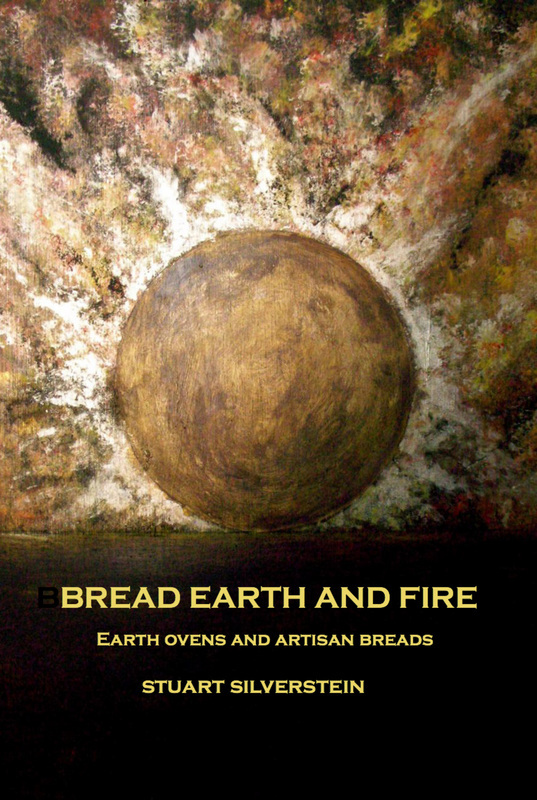 You can use this section of Bread, Earth and Fire as a template for constructing your own earth oven. The information needed is right here for a 22 1/2 inch hearth diameter oven. I’ve chosen this size because I’ve already made some ovens with this hearth diameter, and they’ve worked out well. If you want to change the dimensions, your material quantities will change accordingly, but the basic principals remain the same. You’ll be working in increments of 18 inch, 22 1/2 inch, 27 inch and 31 1/2 inch because firebrick measures 9 x 4 1/2 x 2 1/4 inch. Consider also reading Build Your Own Earth Oven by Kiko Denzer. His book is informative, and his workshops inspirational. Abbott, aged 72, is an artist, 16 mm filmmaker, and art professor. Nancy, aged 70, is a potter and French teacher. Working with them was a rewarding experience for me. They are living proof that numbers don’t add up to anything. Senior citizens? What’s that? None around here. Besides, there were no young men to move 80-pound bags of concrete mix, nor did anyone help them get the rocks up the hill to the building site. They did it all themselves with just a little help from me, and shortly after, they celebrated their fiftieth wedding anniversary. Every step in the process, every peek around the corner, was an adventure for them because they had never done this before. “Please don’t do anything until I get back,” was a common refrain if either of them had to run an errand. When the job was finished, and the first rustic pizza was taken from the blazing oven, we all had to laugh considering what we went through to get to that final stage, but of course it was worth it. After the initial decision was made to construct an earth oven, Abbott and Nancy had to decide where the oven should go. They wanted it close to their home, visible from the deck, but not a fire hazard. They also had to take into account the prevailing winds. It’s best to avoid putting an oven where the wind will blow smoke towards your home or your neighbors. They also needed to find a well-drained location because here in New England frost in the ground can cause an oven to heave up in the spring and create some real problems, such as cracking and shifting the oven off level. Even after finding what they felt was be the best location, they dug down below grade for at least one foot and filled the space with gravel to aid with the drainage. In my own backyard that has standing water in the spring, I dug down two feet before I added gravel. If you are fortunate enough to live in an area where the ground does not freeze, is solid, and has good drainage, then all you’ll have to do is level the surface and pour your pad. Let’s assume the oven you’re going to construct will be for home use, and you are not going to operate a bakery. If you construct a very large oven (larger than a 36 inch floor diameter), it will be a waste of space and materials, and it will use more firewood. A large oven will also take longer to build and contribute unnecessarily to global warming. You won’t need the Taj Mahal of ovens. However, an oven that’s too small will be difficult to maneuver pizzas and breads in and out of. The Meaders decided on a circular oven with a 22 1/2 inch floor diameter. An oven this size will bake four loaves of bread or one twelve-inch pizza.You never bake pizzas with breads...more about this later. Baking one pizza, it should not take more than three and a half minutes to cook. With some help, you can crank out enough pizzas so your garden party of twenty folks will have no reason to complain. I would not, however, build anything smaller than an oven with a floor diameter of 22 1/2 inches. or deck, I am referring to the same place. It is there, where your breads or pizzas sit to bake. Now the Meaders were ready to come up with a supply list. When you construct your oven, it’s a good idea to have all your supplies on hand so you’re not running back and forth to the store. Before you rush over to the Big Box store with your supply list, first find a building supply store that specializes in masonry supplies. Take this book with you so the sales person will know exactly what you’re trying to build. Generally, these stores as well as landscapers will deliver right to your construction sight. They load all the materials onto their truck, and you don’t have to help them unload. This can be a very, very big advantage. Before you sign on the dotted line, you’ll be told exactly how much materials and delivery will cost, and you might find that the price is not much more than if you had bought everything at Big Box. If you choose to shop at Big Box as the Meaders mostly did, remember that you’ll have to unload everything you buy. Big Box will, however, load your cart and vehicle for you. Lifting a sack of concrete mix can weigh 80 pounds, and I don’t care how much iron you pump, you’ll feel the weight. You might need as many as 13 sacks, so all this lifting can be a serious consideration. Also, shopping with a pickup truck can be a real advantage. Big Box, won’t have clay, perlite, firebricks, straw, and sawdust. The firebricks (be sure to buy full size firebricks) are easily found at a masonry supply store. The perlite and straw you will find at a garden supply store, and the sawdust you can get free from someone who does woodworking. If you do happen find perlite at Big Box, it will probably be packaged in small bags. It’s more economical to buy perlite in large bags. I buy perlite in 23 pound bags from a greenhouse. Vermiculite is a similar insulator, and if you can’t find perlite, use vermiculite. Clay can be dug for free if you know where to look, or it can be bought from a pottery supply store. If you live in a rural area, your local hardware store might have most of what you will need. Abbott and Nancy shopped at Big Box, the masonry supply store, and the garden supply store. If they build another oven, I suspect they will consider having some materials delivered. Many years ago I learned to bake bread because the breads being sold from both the supermarket and country store were degenerate looking and mushy feeling. Furthermore, there was an appalling lack of quality ingredients, compounded by a long list of chemical additives with obscure and difficult-to-pronounce names listed on each bread wrapper. I remember back to when I was a child, when my mother brought home bread from the small bakeries in town. The loaves weren’t sweet, but nicely sour, with a chewy texture and a beautiful crust. Another said, “If you make a sponge the bread might taste better.” And finally I was assured, “You have to give the dough a rest because that’s what the recipe says you should do.” I wasn’t quite convinced by these remarks, so I put all the books away and went to see my friend Hal. Hal is one of those people who not only knows how to do everything well, he does it seemingly without effort. Whether it’s resurrecting dead cars, starting a small business, or painting portraits, he gets an A plus. Fortunately for me, Hal knew how to bake bread. He suggested we use wheat. At the time, I was in charge of a wildlife sanctuary that had been bequeathed to a large environmental organization by a rich countess. Included on the sanctuary was a pristine forest, a 100 acre unblemished pond, and, coincidentally, a huge barn with a storage room containing 25,000 pounds of wheat (that’s a 25,000 loaf potential). This vast ocean of wheat had been in the barn since the Great Depression. Thinking a severe famine could spread across the land, the countess bought the wheat to help feed the townspeople. The people never did need the wheat, and it lay untouched for decades until Hal and I scooped up a couple of pounds. We had no grain mill, but Hal said not to worry because there was a mortar and pestle on the kitchen shelf. After a period of time-exactly how much I prefer not to remember-Hal figured we had mashed enough wheat to bake a loaf of bread. Hal called it flour, but I called it battered wheat meal, something you might imagine stone-age people producing. In a bowl we dissolved some yeast and salt in warm water, and then we began to add the wheat meal. The thin gruel changed into quasi-legitimate bread dough. We kneaded the dough, shaped it into a rude loaf, and in spite of itself, or in spite of us, the dough rose a little. We baked it, and the finished loaf was never given a proper chance to cool before we broke it apart, heaped on the butter, and treated ourselves to tremendously superb bread. Who really cared that it was heavy enough to hold down a mobile home during a tornado. I was impressed. Although Hal’s method of making flour was too labor-intensive for me, I didn’t care because this was my first loaf and only a beginning. I became so enamored of bread baking I wanted to show the world how easy and satisfying this enterprise was. What better way than to dole out all the wheat berries in the barn? Thousands upon thousands of people would be baking bread, and the world would be transformed. I was consumed with evangelical fervor, and really did have that many wheat berries. We had heard about Erewhon, a natural food store in Boston, and assumed they were enlightened enough to take all the wheat berries and distribute them to needy people. Hal dragged out the hibachi and put it under the VW bus to heat up the car engine, since his nearly deceased battery wouldn’t turn over a cold engine. It started, barely, and we chugged down to Boston with a sample bag full of wheat berries. At Erewhon we were greeted by a friendly man named Paul Hawken, and we explained our mission. Paul smiled and asked to see the wheat. I gave him the bag and, continuing to smile, Paul politely shook his head no. Had Hal and I seen correctly? "What's wrong?" I asked. Paul pointed to foreign substances in the midst of the wheat berries. He didn't say anymore, but Hal and I knew what he was pointing at. Rodent doo doo in the grain hadn't seemed important to us. At least it was organic, but Hawken was right, of course. I was discouraged, but Hal wasn't. "We'll use the berries for furniture stuffing-you know, like bean bag cushions-and the cats will love this stuff in their box. In this lifetime, I'll never have to buy kitty litter again." My discouragement was extremely short-lived because my psyche seethed with bread baking lust, I had a destiny to fulfill. I’ve been baking bread ever since-not just occasionally but at least once a week. Because I learned to make bread in such a simple, primitive way, I have never been intimidated by the process. I have felt free to explore, to strike out on my own. By relying on my intuitive sense, I have baked all kinds of bread rarely consulting a recipe. A rule of thumb I find helpful is that approximately three and one quarter cups of flour added to a cup and a half of water makes one loaf of bread. People enjoyed my breads so I soon began making enough dough for two loaves, one to keep and one to share. Two loaves can easily be leavened with slightly more than one quarter of a teaspoon of instant dry yeast. When I first learned to bake bread, I was told to use a full packet of yeast per loaf. That certainly works if you’re in a rush, but for me, bread baking works best with patience. Getting beyond elaborate directions has put me in touch with an elemental process in my life. Baking bread bespeaks a link to the past, a past hardly remembered, but which did exist. When we taste and smell good bread, it helps us to remember what we already know: what good bread tastes and looks like. Too bad people succumb to a meretricious factory product, already sliced, packaged in plastic and guaranteed “fresh” until the expiration date. Being patient while baking bread allows you time to enjoy the tactile, sensual stimulation is that one naturally begins to pay attention to the dough. I enjoy the tactile, sensual stimulation of kneading the dough; It feels good. Bread dough also lends itself to being a sculptural process and gives me the perfect chance to experiment. As much as I enjoy kneading the dough, I have realized that with some foreword planning, it’s not necessary. All that is accomplished by kneading happens by itself if you allow the dough to rest overnight, but more about this later. Bread baking might be good for you, too. Guide yourself and the people you live with through the steps and you’ll soon catch on to what is at once a stimulating and meditative activity. Be confident. Often people who have never baked bread think that some unfathomable alchemy takes place. Relax, don’t be rendered powerless. I’ve seen semi-experienced cooks intimidated by bread baking. They pore over the recipe books, break into a sweat, get flour all over the place, make a god-awful mess in the kitchen, take the whole day, wonder if it’s going to work, and often end up with a bread that is not exceptional. My neighbor, for example, who had not been very successful at bread baking, saw recipes and procedures as sacrosanct. She had been admonished to knead the dough until it was no longer “sticky.” She kneaded and kneaded, adding every bit of flour in the house until, from exhaustion, she could barely lift her arms. Now her dough was no longer sticky, but her baked loaves emerged from the oven as densely packed, five pound entities. Quite the Pyrrhic victory. I advised her that bread dough will always be somewhat sticky unless you add 500 pounds of flour to your liquid and create hardened flour cement. Obviously it’s too sticky if it clings to your hands in great, globular, viscous strands. Stickiness is relative, and conveying this quality in a book is not a simple matter. The printed word often disappoints when it comes to giving instructions. My advice is, if you can’t get from A to B by observing someone else’s directions, go right ahead and find your own route. Sometimes it’s a matter of taking a step back to look at what is really going on. A recent experience of mine will show what I mean. Several years ago I became interested in wildflower identification, so with my Peterson Field Guide tucked under my arm, I tromped through field and forest learning all about plants. One day I came upon a lovely yellow flower and I bent over to examine it closely. Okay, the petals were glossy and they overlapped each other, the stalk was hairy, and the plant was two feet high. Turning to the yellow flower section in my book, I began to narrow down the possibilities. No, it was not a pouch-like or bell-shaped flower, and it certainly wasn’t a moth mullein. No chance of it being gumweed either. I spent several minutes searching through the book, but I could not find it. In frustration, I put the book down, stood back, and looked at the flower; I recognized it instantly as a common buttercup! What was going on here? It wasn’t Peterson’s fault I couldn’t identify a buttercup. I had gotten hung up trying to follow directions, trying to find what I was looking for through the words. Books, including this one, can be helpful, but at some point we must put the books aside and go by feel. Had my neighbor and I been a little more trusting of what we already knew or sensed, she would have stopped adding flour and I would have recognized a buttercup. A word about recipes. This book is about ovens and bread, not recipes. It is to be hoped that you will learn from me how to bake delicious bread, but since I cannot be in your kitchen to help you, we’ll have to rely on recipes somewhat to become familiar with a variety of baking techniques. There’s no getting by this. The recipes that I have included will assist the beginning bread baker. I have also included procedures for the graduate. So go by the directions if you want, or take off on your own. If you feel the techniques demonstrated here are somehow too complicated or take too much time, then I heartily encourage you to devise new strategies, vary the proportions, change the ingredients, and twist the dough into any shape you desire. Soon you will have much to share. Try not to get bogged down in anybody's bread baking dogma, including my own or even your own. Every loaf you bake does not have to be the quintessential loaf of bread, and it's not going to be when you work with sourdough. Don't be too rough on yourself. Each loaf you bake is a reflection of you, and you may not be willing to share some of the reflections. I've baked some misshapen loaves that were, any way you cut them, appetite suppressants. Fortunately, the birds around our home are totally nonjudgmental, and, believe me, they got a fair share of what I sneaked away from the oven. If you have a bakery, you would strive for uniformity, but home bakers can afford to be creative. Often amateurs surpass professionals with quality and originality because there's so much less in the way. Professionals are running a business and make decisions to meet their business needs. Your needs are different. Take chances with the bread dough. The outcome, of course, is to share your bread with others. Loosen up and discover that baking bread is really a piece of cake. Well, almost. Now, it’s time to hide your iPhone, walk away from your computer’s glowing screen, shroud your microwave oven with a black cloth, and take part in a process that goes back to the beginning. In my opinion, to make the very finest bread, all you need is flour, water, salt and sourdough starter. Put it all together and you have sourdough bread. Sourdough starter can be made, borrowed or bought. Making your own starter is always an interesting if not sometimes a maddening process. See page 131 to find out what you’ll be getting into. The following is a recipe for just one round loaf. Feel free to expand the recipe to make four loaves. I suggest you start with just one loaf. You can bake this when you’re done making pizzas or flatbreads. Your oven should still be hot enough. 2 1/4 cups unbleached, all purpose white flour. Okay, let’s get ready. Everything you’ll need (except the starter), you can find at your local supermarket or natural foods store. In a large bowl, add 1 1/2 cups of room temperature water, 1/4 cup of starter (straight from the fridge is fine), 1 1/2 teaspoons of salt and stir until the starter is dissolved in the water. Incorporate the whole wheat flour and white flour. Adjust the quantity of flour to insure that your mixture will be quite sticky, but not runny, or you might end up with what looks like a bowl of soup the next day. If you prefer, you can add the water with the dissolved starter and salt to the flour. To incorporate your ingredients, I think you’ll find it much easier to use a dough whisk rather than a wooden spoon. After many, many years of using my wooden spoon, I’ve switched over to the whisk. Make your dough somewhat stiff, but it still should be too sticky to knead. You want the dough coarse or shaggy. 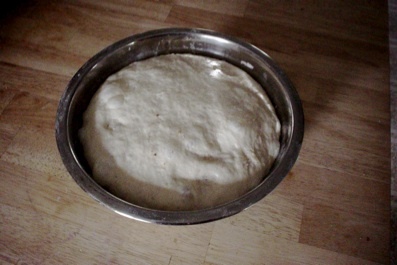 Now cover the dough with a bowl or plate. You don’t want the dough to dry out, and you want to keep opportunistic vermin at bay. Find a place where the temperature is between 65-70ºF for your dough to rise. Put the dough aside. A long cool rise is really best. Assuming you’ve prepared the dough in the afternoon, you will not be baking until the next day. If it’s hot in your house, like 80ºF., prepare the dough in late afternoon or evening, and you should be baking the next morning. While your dough is rising, replenish your starter by stirring in 1/4 cup of flour and enough cool water to make a porridge consistency. Return the starter to the refrigerator. The mass of dough should have expanded overnight and become somewhat puffy. That’s good. Seasonal temperature changes will have an impact on your bread baking. You can expect your dough to take longer to rise in the winter than in the summer. Of course this is assuming you live in a place with defined seasons. If not much rising has occurred overnight then you may have to wait until lunchtime for the next step. Take the cover off the bowl, and bring your risen dough over to your work area. The consistency will not be as stiff today as it was yesterday, but if it’s very soft and gooey, either your room temperature was too high or you didn’t use enough flour. If this is the case, handle the dough gently with your well-floured hands, and next time find a cooler place for your dough to rise. Here in Maine, in the summertime, my kitchen gets quite hot, really too hot for good sourdough preparation. To compensate for the high temperatures, I might reduce the amount of starter I use, and reduce the proofing time. Of course, every situation is different so experiment to see what works best for you. Now get ready for baking. 1 1/2 hours before bake-time (and that’s now), spread some flour on your work surface. Using a plastic dough scraper or wooden spoon, flop out the dough onto the surface. Sprinkle flour on top. The flour makes the sticky dough easier to handle as you fold and shape it. Flatten the dough first, use a dough divider to assist in folding. Don’t rip or tear the dough. It has a structure, thanks to the gluten, it wants to maintain. The gluten, which formed by itself during the long overnight rise (proof), is now a muscular framework that will give the finished loaf a desirable stretchy quality. . . Though not leavened with starter or yeast, Peter’s bread leavens itself through the long fermentation process. Often heavy as lead and tough as 16-penny nails, this bread is delicious to eat, though not particularly easy to make. Schumann rye should be eaten after it has thoroughly cooled. Slice it thinly, and consider gloves to protect your hands if you have some serious slicing to do. Store your loaf at room temperature in a paper bag, and it will keep for days. Those who acquire a taste for sour rye often consider it their favorite bread, although it can, without doubt, precipitate tired jaw syndrome (TJS). Nevertheless, after eating this bread, I frequently ask myself why I should bother with anything else. In a medium-sized mixing bowl, thoroughly stir the rye flour into the warm water. Cover the bowl with a plate, and leave it in a warm place (70-80ºF). The souring process should be under way. Give it a stir everyday. After about 3 days the rye mixture should have a sour aroma, and it should be bubbling. It might take only 2 days or it could take as long as 5 days. Room temperature determines the time. The warmer the environment, the more quickly the rye will sour. If mold forms on the top, as it has on mine, Peter says not to worry about it. I did worry about it, but scraped the mold off as he said to, and I’m still healthy. When the rye has reached the level of sourness that seems right to you (trust your instincts here), stir in the salt and about 1 1/4 cups of rye flour. The amount of flour can vary considerably with this recipe, but this shouldn’t daunt you because you are by now well aware of the many variables in bread baking. The rye mixture should be quite dense. Cover and let ferment overnight. The next day, turn out the dough on a heavily floured surface. Expect the dough to remain sticky. Perhaps that’s an understatement. Working with rye dough is like working with tile cement. Absolutely dreadful, but that’s simply the nature of it. Divide the dough in two, fold and place on your floured peel. The dough should not be taller than 1 1/2” or it might burn before it bakes through. You’ve fired your oven, removed the ashes and cleaned the floor. Bake in a medium oven 20-30 minutes. Slice thinly and dip in extra virgin olive oil in which you’ve crushed some fresh garlic. I don’t think you’ll be disappointed. In a large bowl, add the water, the starter (straight from the fridge is fine), salt, and then stir until the starter is dissolved. Now incorporate the flour. Stir until it’s evenly mixed. If all the flour won’t stir in, then you’ve added too much flour. Add a little water. Don’t forget to replenish your starter by stirring in 1/4 cup of flour and enough cool water to make a porridge consistency. Return the starter to the refrigerator after a couple of hours if you’re going to use it the next day, or you can return it immediately to the refrigerator if you won’t be using it until the next week. The mass of dough should have expanded overnight, and that’s what you want. Temperatures above or below 70ºF. Will change your timing. If not much has occurred, then you may have to wait until lunchtime for the next step. You are looking for expansion. Your dough will not be as stiff today as it was yesterday, but if it’s very soft and gooey, then your room temperature was probably too high or you didn’t use enough flour. If this is the case, dump the dough onto your work surface where you’ve spread out a 1/2 cup of flour. Lightly flour the top of the dough and flatten it with your well-floured hands. Using the dough divider to assist, fold the dough, flatten it again and fold again. This should help to stiffen it. Handle the dough very gently and next time find a cooler place for your dough to rise. Use the dough divider to cut the dough into about eight equal size chunks. Cover and let the dough rest for about 15 minutes. Then roll out a chunk of dough with a rolling pin, but if you don’t have one, a wine bottle will work. A diameter of about 6 inches and a thickness of about 3/8 inch is about right. Your oven has been fired, with the fire pushed to the back or side, and the floor is 600ºF-700ºF. Using your wooden peel, slide some pitas into the oven. In less than a minute they should balloon up. If they don’t, then your pitas are not thick enough or your oven is not hot enough. Pitas bake quickly, and if you over-bake them, they’ll turn brittle so remove the pitas from the oven before they reach that stage. Pitas also cool quickly and you can eat them almost immediately. Do I really want a wood-fired oven? Should my oven be brick or mud? It’s really your call. There are advantages and disadvantages to each. Reading the book should help you to decide. Can my oven be round or rectangular? Your oven can be round or rectangular. If you build a mud oven, probably it will be round or roundish, most of them are. A brick oven can be either, but a rectangular shape may be easier to build. I have been told that just about all Italian pizza ovens in Italy are round. You might get better heat circulation and more space in a round oven. Should I buy fireclay or can I dig my own? Fireclay you buy is much easier to use than hand dug clay. The quality of both can be equal. How long will it take to build an oven? If you’ve already completed the base, then you should be able to complete the oven over a weekend with a few friends. You can, but it’s much easier if you have help. What’s the most difficult thing about building an earth oven? Mixing the correct proportions of clay, sand and water takes a bit of practice. Too wet and the oven will slump. Too dry and it will tend to crumble. Give serious thought to first making a practice, mini-oven. Will my oven need a roof? For best protection, your oven should have a roof. How much will my oven cost? If labor is free, then you can expect to spend from $50.00 to $500.00. I realize that’s quite a separation in range, but I don’t know if you’ll be scavenging materials or having everything delivered to your door. How big should the oven be? Perlite is a volcanic glass and a derivative of silica. Vermiculite is a natural clay mineral that expands with the application of heat. Either can be used to insulate your earth oven. How do I mix up perlite or vermiculite for insulation? The usual measure is six parts of perlite or vermiculite to one part Portland cement. Mix it up dry, and then add just enough water to get it to hold together. How long do I have to fire my oven before I can bake in it? For bread baking, probably two hours. For pizzas and flatbreads, about an hour. No you don’t, but a chimney will make it easier to start a fire and will help to keep smoke out of your face. I build ovens without chimneys. Can I build my oven indoors? I wouldn’t recommend it unless you have a mason who has built wood-fired ovens do it for you. You simply don’t want to risk setting your home ablaze. My earth oven has cracks! I’ve never seen an earth oven without cracks. Generally cracks are not life threatening. When clay soil dries, it cracks. Simply patch the cracks with mud. More details in the book. 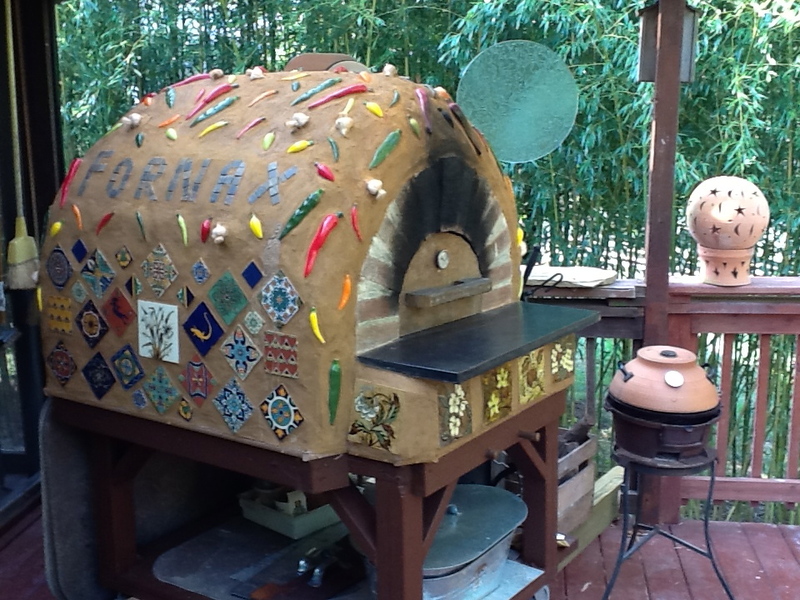 How long will my earth oven last? There’s really no telling. Treat it gently, protect it from the elements and it could last many years. Will my oven cause air pollution? It sure will, but so do electric and gas ranges if you consider the total cycle of electricity or gas. To minimize the pollution you create, try the top down burn to start your fire and only burn the driest wood. Moreover, a well-insulated oven causes less air pollution because it doesn’t take as much wood to fire it. Not many of us are willing to forego the pleasures of a home-cooked meal and totally revert to raw food. Burn any type of wood that is thoroughly dry and totally free of paint and/or preservatives. I prefer dry hardwoods. 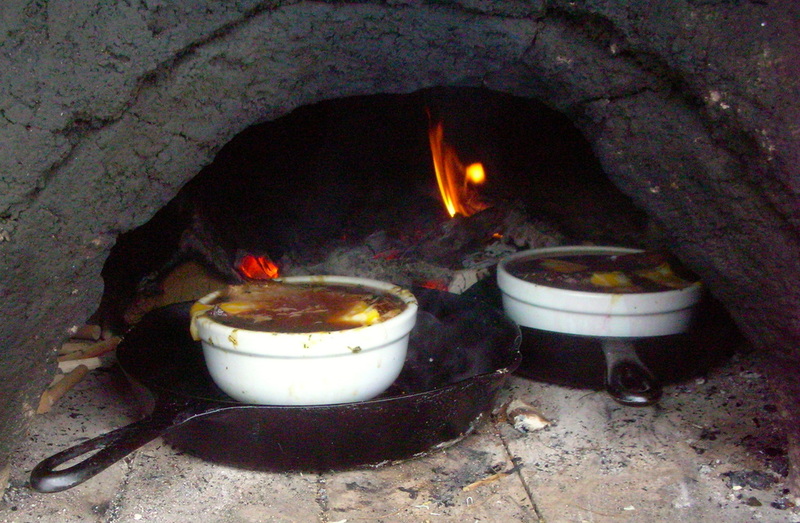 Is it difficult to bake in a wood-fired oven? At first it’s difficult, but with practice, you’ll get it right. Do I need to spray my oven during the bake? Spraying or misting your oven can improve the quality of the bread crust. Experiment. You may not need the extra moisture. Do I need a wooden peel as well as a metal one? Yes. Use the wooden peel for delivering breads into the oven and the metal one for removing them. A very thin wooden peel might be used for both functions. Can I cook things other than bread in my oven? You can cook different things in your oven. Besides bread, I bake desserts, corn, make French onion soup and roast chickens. Why does it take so long for my breads to rise? Assuming your instant yeast or your starter are in excellent condition, then probably your kitchen or bake house temperature is too cool. 70ºF is about right. What are the easiest breads to bake? Do I really have to knead the dough to make great bread? Let the passage of time do the kneading for you. An overnight proof eliminates the necessity of kneading. Why am I always being told to wait a while before slicing into a bread that has just come from the oven? The bread is still baking, and if you don’t give it time to finish baking while cooling on a rack, it will be gummy inside. Should I make my own sourdough starter or should I beg, borrow or buy a proven starter? If this is your first attempt at sourdough bread baking, I suggest you use a starter that has worked for someone else. After you become proficient at sourdough bread baking, then try making your own starter. How often should I feed my starter? Are sourdough breads more difficult to make than breads with instant yeast? Any suggestions about what to do with leftover bread? If you’ve given away all you can, then consider French onion soup, Tuscan bread soup, croutons, breadcrumbs, French toast, bread pudding, stuffing and of course, food for the birds. Can you recommend other books? The book about earth oven construction. It’s all here. The Bread Builders by Dan Wing and Alan Scott Their wonderful book is a masterwork that concerns itself with baking natural loaves in the type of oven you’ve just learned how to build. If I were to have just one book about bread baking. This would be the one.